Originally from Heyfield in country Victoria, Cox was somewhat of a cult hero when he broke into the side for the Ansett Cup in 1999 as a bald headed kid who provided excitement and bite in the Hawthorn forward line. 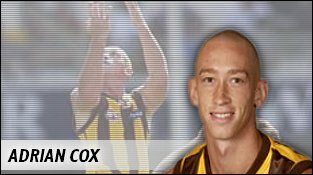 Dropped after his first senior appearance in round one of that year, it would take more than 18 months before a re-born Adrian Cox would play for Hawthorn again. The 77th pick in the 1998 National Draft, Cox honed his new game at Box Hill, and after several weeks of form demanding selection for the seniors, he came out and helped beat Richmond in round fourteen of 2001. Staying in the side through the finals as a dashing wingman/backman, it was his run and long goals that made him a fan favourite once again. Best used on the wing, Cox could be exposed when playing on a man in defence. This did not stop in from playing 18 games in a stellar season for Hawthorn in 2002, but he struggled to stay in the side during 2003 and 2004, and was eventually delisted.